The General Atomics MQ-9 Reaper (sometimes called Predator B) is an unmanned aerial vehicle (UAV) capable of remotely controlled or autonomous flight operations developed by General Atomics Aeronautical Systems (GA-ASI) primarily for the United States Air Force (USAF). The MQ-9 and other UAVs are referred to as Remotely Piloted Vehicles/Aircraft (RPV/RPA) by the USAF to indicate their human ground controllers. The MQ-9 is the first hunter-killer UAV designed for long-endurance, high-altitude surveillance. In 2006, the then–Chief of Staff of the United States Air Force General T. Michael Moseley said: "We've moved from using UAVs primarily in intelligence, surveillance, and reconnaissance roles before Operation Iraqi Freedom, to a true hunter-killer role with the Reaper." In 2008, the New York Air National Guard 174th Attack Wing began the transition from F-16 piloted fighters to MQ-9A Reapers, becoming the first fighter unit to convert entirely to unmanned combat aerial vehicle (UCAV) use. In March 2011, the U.S. Air Force was training more pilots for advanced unmanned aerial vehicles than for any other single weapons system. The Reaper is also used by the United States Navy, the CIA, U.S. Customs and Border Protection, NASA, and the militaries of several other countries. The USAF operated 195 MQ-9 Reapers as of September 2016, and plans to keep the MQ-9 in service into the 2030s. General Atomics began development with the "Predator B-001", a proof-of-concept aircraft, which first flew on 2 February 2001. Abraham Karem is the designer of the Predator. The B-001 was powered by an AlliedSignal Garrett TPE331-10T turboprop engine with 950 shaft horsepower (710 kW). It had an airframe that was based on the standard Predator airframe, except with an enlarged fuselage and wings lengthened from 48 feet (15 m) to 66 feet (20 m). The B-001 had a speed of 220 knots (410 km/h; 250 mph) and could carry a payload of 750 pounds (340 kg) to an altitude of 50,000 feet (15,000 m) with an endurance of 30 hours. The company refined the design, taking it in two separate directions. The first was a jet-powered version; "Predator B-002" was fitted with a Williams FJ44-2A turbofan engine with 10.2 kilonewtons (2,300 lbf; 1,040 kgf) thrust. It had payload capacity of 475 pounds (215 kg), a ceiling of 60,000 feet (18 km) and endurance of 12 hours. The USAF ordered two airframes for evaluation, delivered in 2007. The first two airframes delivered with prototypes B-001 and B-002 (now in the USAF museum at Wright-Patterson AFB). B-002 was originally equipped with the FJ-44 engine but it was removed and a TPE-331-10T was installed so that the USAF could take delivery of two aircraft in the same configuration. The second direction the design took was the "Predator B-003", referred to by GA as the "Altair", which has a new airframe with an 84-foot (26 m) wingspan and a takeoff weight of approximately 7,000 pounds (3,200 kg). Like the Predator B-001, it is powered by a TPE-331-10YGD turboprop. This variant has a payload capacity of 3,000 pounds (1,400 kg), a maximum ceiling of 52,000 feet (16 km), and an endurance of 36 hours. In October 2001, the USAF signed a contract for an initial pair of Predator Bs (001 and 002) for evaluation. Designated YMQ-9s due to their prototype role, they were delivered in 2002. The USAF referred to it as "Predator B" until it was renamed "Reaper". The USAF aimed for the Predator B to provide an improved "deadly persistence" capability, flying over a combat area night-and-day waiting for a target to present itself, complementing piloted attack aircraft, typically used to drop larger quantities of ordnance on a target, while a cheaper RPV can operate almost continuously using ground controllers working in shifts, but carrying less ordnance. Operators, stationed at bases such as Creech Air Force Base, near Las Vegas, Nevada, can hunt for targets and observe terrain using multiple sensors, including a thermographic camera. One claim was that the on-board camera is able to read a license plate from two miles (3.2 km) away. An operator's command takes 1.2 seconds to reach the drone via a satellite link. The MQ-9 is fitted with six stores pylons; the inner stores pylons can carry a maximum of 1,500 pounds (680 kg) each and allow carriage of external fuel tanks. The mid-wing stores pylons can carry a maximum of 600 pounds (270 kg) each, while the outer stores pylons can carry a maximum of 200 pounds (91 kg) each. An MQ-9 with two 1,000 pounds (450 kg) external fuel tanks and one thousand pounds of munitions has an endurance of 42 hours. The Reaper has an endurance of 14 hours when fully loaded with munitions. The MQ-9 carries a variety of weapons including the GBU-12 Paveway II laser-guided bomb, the AGM-114 Hellfire II air-to-ground missiles, the AIM-9 Sidewinder, and the GBU-38 Joint Direct Attack Munition (JDAM). Tests are underway to allow for the addition of the AIM-92 Stinger air-to-air missile. By October 2007, the USAF owned nine Reapers, and by December 2010 had 57 with plans to buy another 272, for a total of 329 Reapers. Critics have stated that the USAF's insistence on qualified pilots flying RPVs is a bottleneck to expanding deployment. USAF Major General William Rew stated on 5 August 2008, "For the way we fly them right now"—fully integrated into air operations and often flying missions alongside manned aircraft—"we want pilots to fly them." This reportedly has exacerbated losses of USAF aircraft in comparison with US Army operations. In March 2011, U.S. Department of Defense Secretary Robert Gates stated that, while manned aircraft are needed, the USAF must recognize "the enormous strategic and cultural implications of the vast expansion in remotely piloted vehicles..." and stated that as the service buys manned fighters and bombers, it must give equal weight to unmanned drones and "the service's important role in the cyber and space domains." In 2013, the Air Force Special Operations Command (AFSOC) sought the ability to pack up an MQ-9 in less than eight hours, fly it anywhere in the world aboard a C-17 Globemaster III, and then have it ready to fly in another eight hours to support special operations teams at places with no infrastructure. MQ-1 and MQ-9 drones must fly aboard cargo aircraft to travel long distances as they lack the refueling technology or speed to travel themselves; the C-17 is large enough to carry the aircraft and support systems and can land on short runways. Pilots traveling with the Reaper will use the ground control station to launch and land the aircraft, while most of the flying will be done by US-based pilots. In November 2012, Raytheon completed ground verification tests for the ADM-160 MALD and MALD-J for integration onto the Reaper for an unmanned suppression of enemy air defenses capability. On 12 April 2013, a company-owned MQ-9 equipped with a jamming pod and digital receiver/exciter successfully demonstrated its electronic warfare capability at Marine Corp Air Station (MCAS) Yuma, performing its mission in coordination with over 20 participating aircraft. A second electronic warfare test, fitted with the Northrop Grumman Pandora EW System, was conducted on 22 October 2013 with other unmanned aircraft and Northrop Grumman EA-6B Prowlers, showing effectiveness in a multi-node approach against a more capable IADS. In 2011, the U.S. Missile Defense Agency (MDA) reported its interest in using the Reaper and its MTS-B sensor to provide firing quality data for early interception of ballistic missile launches. The MDA is exploring concepts to use the UAV's EO/IR sensor to achieve "launch-on-remote" capabilities with missile interceptors before detection by Aegis radars. At least two aircraft would be needed to triangulate a target to provide high-fidelity data. The MTS-B includes short and mid-wave IR bands, optimal for tracking launch and rocket burn. In 2013, the MDA terminated plans to build a follow-on to the two orbiting Space Tracking and Surveillance System (STSS) satellites due to near-term costs, opting to continue testing the Reaper for ballistic missile target discrimination. The MDA planned to test the improved MTS-C sensor, which adds a long-wave IR detector optimized for tracking cold bodies such as missiles and warheads after booster burnout, or plumes and exhaust. The goal is to use data from multiple high-flying UAVs to provide an off-board cue to launch an SM-3 missile from an Aegis ship. Two Reapers demonstrated their ability to track ballistic missiles using their MTS-B EO/IR turret during a test in late June 2016. In June 2015, a study by the USAF's Scientific Advisory Board identified several improvements for operating the Reaper in contested airspace; adding readily available sensors, weapons, and threat detection and countermeasures could increase situational awareness and enable riskier deployments. Suggestions included a radar warning receiver (RWR) to know when it's being targeted, air-to-air and miniature air-to-ground weapons, manned-unmanned teaming, multi-UAV control, automatic take-offs and landings, and precision navigation and timing systems to fly in GPS-denied areas. Another idea was redesigned ground control stations with user-friendly video game-like controllers and touchscreen maps to access data without overwhelming operators. In October 2015, Air Force deputy chief of staff for ISR Robert Otto suggested redesigning the MQ-9's GCS to be operated by one person for most missions rather than two (to fly and work the sensors) to simplify operations and reduce manpower requirements by hundreds of sensor operators. Introducing an auto-land capability would also reduce the Reaper's manpower requirements to staff launch and recovery teams. Automatic take-off and landing capabilities are already present in the RQ-4 Global Hawk and MQ-1C Gray Eagle, and are planned to be provided to the MQ-9 in 2017. The Air Force requires the manually loaded Reaper to operate from a runway at least 5,000 ft (1.5 km) long, but automated take-offs and landings would enable it to operate from a 3,000 ft (0.91 km) runway. In April 2017, an MQ-9 Block 5 flew with a Raytheon ALR-69A RWR in its payload pod to demonstrate the aircraft's ability to conduct missions in the proximity of threat radars and air defenses, the first time this capability was demonstrated on a remotely piloted aircraft. A typical MQ-9 system consists of multiple aircraft, ground control station, communications equipment, maintenance spares, and personnel. A military crew includes a pilot, sensor operator, and Mission Intelligence Coordinator. The aircraft is powered by a 950 horsepower (710 kW) turboprop, with a maximum speed of about 260 knots (480 km/h; 300 mph) and a cruising speed of 150–170 knots (170–200 mph; 280–310 km/h). With a 66 ft (20 m) wingspan, and a maximum payload of 3,800 lb (1,700 kg), the MQ-9 can be armed with a variety of weaponry, including Hellfire missiles and 500-lb laser-guided bomb units. Endurance is 30 hours when conducting ISR missions, which decreases to 23 hours if it is carrying a full weapons load. The Reaper has a range of 1,000 nmi (1,150 mi; 1,850 km)[dubious – discuss] and an operational altitude of 50,000 ft (15,000 m), which makes it especially useful for long-term loitering operations, both for surveillance and support of ground troops. 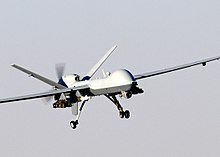 The Predator and Reaper were designed for military operations and not intended to operate among crowded airline traffic. The aircraft typically lack systems capable of complying with FAA See-And-Avoid regulations. On 18 May 2006, the Federal Aviation Administration (FAA) issued a certificate of authorization allowing MQ-1 and MQ-9 UAVs to fly in U.S. civil airspace to search for survivors of disasters. In 2005, requests were made for MQ-9s to be used in search and rescue operations following Hurricane Katrina but, as there was no FAA authorization in place at the time, it was not used. An MQ-9 can adopt various mission kits and combinations of weapons and sensors payloads to meet combat requirements. Its Raytheon AN/AAS-52 multi-spectral targeting sensor suite includes a color/monochrome daylight TV, infrared, and image-intensified TV with laser rangefinder/laser designator to designate targets for laser guided munitions. The aircraft is also equipped with the Lynx Multi-mode Radar that contains synthetic aperture radar (SAR) that can operate in both spotlight and strip modes, and ground moving target indication (GMTI) with Dismount Moving Target Indicator (DMTI) and Maritime Wide-Area Search (MWAS) capabilities. The Reaper was used as a test bed for Gorgon Stare, a wide-area surveillance sensor system. Increment 1 of the system was first fielded in March 2011 on the Reaper and could cover an area of 16 km2 (6.2 sq mi); increment 2, incorporating ARGUS-IS and expanding the coverage area to 100 km2 (39 sq mi), achieved initial operating capability (IOC) in early 2014. The system has 368 cameras capable of capturing five million pixels each to create an image of about 1.8 billion pixels; video is collected at 12 frames per second, producing several terabytes of data per minute. In January 2012, General Atomics released a new trailing arm design for the Reaper's main landing gear; benefits include an over 30 percent increase in landing weight capacity, a 12 percent increase in gross takeoff weight (from 10,500 pounds (4,800 kg) to 11,700 pounds (5,300 kg)), a maintenance-free shock absorber (eliminating the need for nitrogen pressurization), a fully rejected takeoff brake system, and provisions for automatic takeoff and landing capability and Anti-lock Brake System (ABS) field upgrades. In April 2012, General Atomics announced possible upgrades to USAF Reapers, including two extra 100 US gallons (380 l) fuel pods under the wings to increase endurance to 37 hours. The wingspan can also be increased to 88 feet (27 m), increasing endurance to 42 hours. The USAF has bought 38 Reaper Extended Range (ER) versions, carrying external fuel tanks (which don't affect weapon capacity), the heavy-weight landing gear, a four-bladed propeller, a new fuel management system which ensures fuel and thermal balance among external tank, wing, and fuselage fuel sources, and an alcohol water injection (AWI) system to shorten required runway takeoff length; these features increase endurance from 27 to 33–35 hours, while the company is still pitching the lengthened wing option. The Reaper ER first flew operationally in August 2015. The aircraft also has the sensor ball replaced with a high-definition camera, better communications so ground controllers can see the higher quality video, software to enable automatic detection of threats and tracking of 12 moving targets at once, and the ability to "super ripple" fire missiles within 0.32 seconds of each other. On 25 February 2016, General Atomics announced a successful test flight of the new Predator-B/ER version. This new version has had the wingspan extended to 79 feet, increasing its endurance to 40 hours. Other improvements include "short-field takeoff and landing performance and spoilers on the wings which enable precision automatic landings. The wings also have provisions for leading-edge de-ice and integrated low- and high-band RF antennas." On 1 May 2007, the USAF's 432d Wing was activated to operate MQ-9 Reaper as well as MQ-1 Predator UAVs at Creech Air Force Base, Nevada. The pilots first conducted combat missions in Iraq and Afghanistan in the summer of 2007. On 28 October 2007, the Air Force Times reported an MQ-9 had achieved its first "kill", successfully firing a Hellfire missile against Afghanistan insurgents in the Deh Rawood region of the mountainous Oruzgan province. By 6 March 2008, according to USAF Lieutenant General Gary North, the Reaper had attacked 16 targets in Afghanistan using 500 lb (230 kg) bombs and Hellfire missiles. On 17 July 2008, the USAF began flying Reaper missions within Iraq from Balad Air Base. It was reported on 11 August 2008 that the 174th Fighter Wing would consist entirely of Reapers. By March 2009 the USAF had 28 operational Reapers. Beginning in September 2009, Reapers were deployed by the Africa Command to the Seychelles islands for use in Indian Ocean anti-piracy patrols. On 13 September 2009, positive control of an MQ-9 was lost during a combat mission over Afghanistan, after which the control-less drone started flying towards the Afghan border with Tajikistan. An F-15E Strike Eagle fired an AIM-9 missile at the drone, successfully destroying its engine. Before the drone impacted the ground, contact was reestablished with the drone, and it was flown into a mountain to destroy it. It was the first US drone to be destroyed intentionally by allied forces. By July 2010, thirty-eight Predators and Reapers had been lost during combat operations in Afghanistan and Iraq, another nine were lost in training missions in the U.S. In 2010, the USAF conducted over 33,000 close air support missions, a more-than-20 percent increase compared with 2009. By March 2011, the USAF had 48 Predator and Reaper combat air patrols flying in Iraq and Afghanistan compared with 18 in 2007. As of March 2011, the USAF was training more pilots for advanced unmanned aerial vehicles than for any other single weapons system. In 2012, the Reaper, Predator and Global Hawk were described as "... the most accident-prone aircraft in the Air Force fleet." These figures must be taken with caution due to the aircraft's nature, often performing hostile or dangerous missions. In October 2011, the USAF began operating Reapers out of Arba Minch Airport in Ethiopia for surveillance-only operations in Somalia. In 2012, both Reapers and Predators were deployed in Benghazi, Libya after the attack that killed the US ambassador in that city. 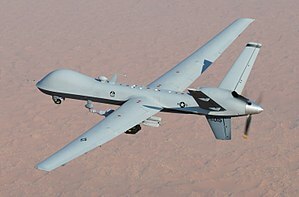 In February 2013, the U.S. stationed a Predator at Niamey to provide intelligence for French forces during Operation Serval in Mali, it was later replaced by two MQ-9 Reapers. In April 2013, one of these Reapers crashed on a surveillance flight due to mechanical failure. On 22 October 2013, the USAF's fleets of MQ-1 Predator and MQ-9 Reaper UAVs reached 2,000,000 flight hours. The RPA program began in the mid-1990s, taking 16 years for them to reach 1 million flight hours; the 2 million hour mark was reached just two and a half years later. The high demand for UAVs has caused Air Combat Command to increase pilot output from 188 in 2015 to 300 in 2017 at Holloman. On 13 November 2015, the Pentagon reported that an MQ-9 had killed ISIL member Mohammed Emwazi, popularly known as "Jihadi John", who was responsible for executing several Western prisoners. In 2015, a record number (20) of Air Force drones crashed. Working with engineers from General Atomics, investigators identified three parts of the starter-generator that were susceptible to breakdowns. But they could not determine why they were failing. Col. William S. Leister informed Pentagon officials that investigators from the Air Force, General Atomics and Skurka had investigated the problem for more than a year. The team, he said, had identified "numerous manufacturing quality issues" yet had been unable to determine the exact cause of the failures. On 2 October 2017, U.S. Central Command stated that a MQ-9 had been shot down by Houthi air defense systems over Sanaa in western Yemen the previous day. The aircraft took off from Chabelley Airport in Djibouti, and was armed. NASA initially expressed interest in a production version of the B-002 turbofan-powered variant, but instead leased an unarmed Reaper variant, which carries the GA-ASI company name "Altair". Altair is one of the first three "Predator-B" airframes. The other two airframes, known as "Predator-B 001" and "Predator-B 002", had a maximum gross weight of 7,500 pounds (3,400 kg). Altair differs from these models in that it has an 86-foot (26 m) long wingspan (20-foot (6.1 m) greater than early and current MQ-9s). The Altair has enhanced avionics systems to better enable flights in FAA-controlled civil airspace and demonstrate "over-the-horizon" command and control capability from a ground station. These aircraft are used by NASA's Earth Science Enterprise as part of the NASA ERAST Program to perform on-location science missions. In November 2006, NASA's Dryden Flight Research Center obtained an MQ-9 (and mobile ground control station), named Ikhana, for the Suborbital Science Program within the Science Mission Directorate. In 2007, Ihkana was used to survey the Southern California wildfires, supporting firefighter deployments based upon the highest need. The California Office of Emergency Services had requested NASA support for the Esperanza Fire, and the General Atomics Altair was launched less than 24 hours later on a 16-hour mission to map the fire's perimeter. The fire mapping research is a joint project with NASA and the US Forest Service. The NASA Ikhana was used to survey the descent of the Orion Exploration Flight Test 1 (EFT-1) module on its first test mission 5 December 2014. The aircraft loitered at 27,000 ft (8,200 m), used its IR camera to detect the capsule, then switched to the optical camera to observe its descent through parachute deployment and landing in the Pacific Ocean. CBP's and USCG's maritime variant of the Predator B, called "Guardian"
U.S. Customs and Border Protection (CBP) operated nine MQ-9s in August 2012. Two were based in North Dakota at Grand Forks Air Force Base, four were based in Arizona, at Fort Huachuca and one was based at the Naval Air Station Corpus Christi, Texas. These aircraft were equipped with GA-ASI's Lynx synthetic aperture radar and Raytheon's MTS-B electro-optical infrared sensors. CBP also had two maritime MQ-9s called Guardians, based at Cape Canaveral Air Force Station, Florida and Naval Air Station Corpus Christi, Texas. The Guardians were equipped with the SeaVue marine search radar; their electro-optical infrared sensor was optimized for maritime operations. The CBP operates one MQ-9 Guardian jointly with the U.S. Coast Guard (USCG) out of land-based stations in Florida and Texas. The United States Department of Homeland Security initially ordered one Predator B for border protection duty, referred to as MQ-9 CBP-101. It began operations 4 October 2005 and crashed in the Arizona desert on 25 April 2006. The US's NTSB determined that the crash's cause most likely pilot error by the ground-based pilot, inadvertently shutting down the UAV's engine by failing to follow the checklist. During its operational period, the aircraft flew 959 hours on patrol and had a part in 2,309 arrests. It also contributed to the seizure of four vehicles and 8,267 pounds (3,750 kg) of marijuana. A second Predator B, called "CBP-104" (initially referred to as "CBP-102"), was delivered in September 2006 and commenced limited border protection operations on 18 October 2006. The president's FY2006 emergency supplemental budget request added $45 million for the program and the FY2007 Homeland Security Appropriations Bill added an additional $20 million. In October 2006, GA-ASI announced a $33.9 million contract to supply two more Predator B systems by the fall of 2007. On 16 February 2009, the program was further expanded to include patrols of the Canada–US border. On 14 October 2013, an MQ-9 began patrolling the Manitoba portion of the U.S.-Canada border. The UAV is based at Grand Forks Air Force Base and will watch the 400 km (250 mi)-long border. The drone will not carry weapons and needs permission to enter Canadian airspace. U.S. authorities fear that drug smugglers, migrants, and terrorists may exploit the long border. The use of the unmanned surveillance aircraft is an enhancement of the partnership between U.S. and Canadian agencies. In January 2014, Customs and Border Protection grounded its UAVs temporarily after an unmanned aircraft was ditched off the coast of California by the operator due to a mechanical failure on 27 January 2014. In February 2015, it was announced that six RAAF personnel have been sent to Holloman AFB in New Mexico and Creech AFB in Nevada to undergo training. In August 2015, it was revealed that Australians had begun flying MQ-9s over Syria, the first time Australia expanded operations past Iraq during the Military intervention against the Islamic State of Iraq and the Levant. Five RAAF personnel were embedded with the USAF 432d Operations Group, which flies armed Reapers, performing operational duties with the unit as MQ-9 system pilots and sensor operators. In November 2018, the Defence Minister Christoper Pyne announced that Australia would purchase between 12 and 16 MQ-9s. The Predator UAV "Guardian" has been used by the Dominican Republic, under U.S. supervision and funding, against drug trafficking from mid-2012. On 31 May 2013, French Defense Minister Jean-Yves Le Drian confirmed the order of two MQ-9 Reapers, to be delivered by the end of 2013. It was chosen to replace the EADS Harfang and was picked over the Israeli Heron TP. On 27 June 2013, the U.S. Defense Security Cooperation Agency notified Congress of a possible Foreign Military Sale to France for 16 unarmed MQ-9s, associated equipment, ground control hardware, and support, worth up to $1.5 billion total. On 26 August 2013, France and the US Department of Defense concluded the deal for 16 Reapers and 8 ground control stations, with French operators beginning training. On 24 September 2013, France's first pair of MQ-9 pilots conducted a two-hour training sortie at Holloman Air Force Base, New Mexico. Both French pilots had prior UAV experience, and went through a five-week ground-based training course and 5 hours on a flight simulator before the first flight. Two additional crews were also receiving instruction at the facility. 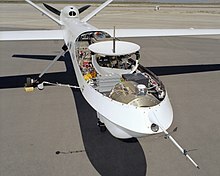 General Atomics is due to deliver two Reapers and one ground control station to the French Air Force by the end of 2013. On 26 November 2013, France declared that six pilots in three teams were operational, following 100 hours on flight simulators and 4 flights. French MQ-9s were first put into action in January 2014 at Niamey Air Base in Niger for border reconnaissance in the Sahel desert. On 16 January 2014, France's first MQ-9 flight occurred from Niger. The first two Reapers to enter French service are designated Block 1 and use U.S. equipment; further orders are to be modified with European payloads such as sensors and datalinks. On 31 March 2014, French Air Force Reapers accumulated 500 flight hours in support of Operation Serval. In July 2014, a French MQ-9 helped to locate the wreckage of Air Algérie Flight 5017, which had crashed in Mali. Germany made a request to purchase five Reapers and four ground control stations, plus related support material and training. The request, being made through the Foreign Military Sales process, was presented to Congress through the Defense Security Cooperation Agency on 1 August 2008 and is valued at US$205 million. However, Germany did not go through with this procurement for the time being and decided to lease the IAI Heron offered by IAI and Rheinmetall instead, initially for the duration of one year, representing a stop-gap measure before a long-term decision on a MALE-system is being made. into Afghanistan theater by January 2014. (to replace Predator A+). On 3 November 2015, the U.S. approved a deal covering weapons integration onto Italy's Reaper aircraft, which would make it the first country outside the UK to weaponise the drone. The potential for increased contribution to NATO coalition operations, improved operational flexibility, and enhanced survivability for Italian forces prompted the request. On 6 August 2015, the Spanish Ministry of Defence announced it would buy four Reaper surveillance aircraft with two ground control stations for €25 million ($27 million) in 2016, costing €171 million over five years. General Atomics will partner with Spanish Company SENER to deliver unarmed versions to Spain, making it the fifth European country to order the Reaper. In addition to selecting the Reaper, Spain is interested in the joint German-French-Italian project to develop a European MALE UAV. The Defense Department cleared the purchase on 6 October 2015. Spain selected the Reaper over the Heron TP to perform homeland security, counter-insurgency, and counter-terrorism operations. The Spanish government agreed to purchase the system on 30 October. The Reaper was selected over the Heron TP mainly for commonality with NATO allies who also use the airframe. Although Spain's immediate priority is for surveillance, they will eventually try to weaponize the platform. The first two aircraft and first GCS is planned for delivery in 2017, with the third aircraft in 2018 when they achieve IOC, and the last in 2020 achieving full operational capability (FOC). On 27 September 2006, the U.S. Congress was notified by the Defense Security Cooperation Agency that the United Kingdom was seeking to purchase a pair of MQ-9A Reapers. They were initially operated by No. 39 Squadron RAF from Creech Air Force Base, Nevada later moving to RAF Waddington. A third MQ-9A was in the process of being purchased by the RAF in 2007. On 9 November 2007, the UK Ministry of Defence (MOD) announced that its Reapers had begun operations in Afghanistan against the Taliban. In April 2008, following the crash of one of the UK's two Reapers, British special forces were sent to recover sensitive material from the wreckage before it was blown up to prevent the enemy from obtaining it. By May 2011, five Reapers were in operation, with a further five on order. The second RAF squadron to operate five Reapers is XIII Sqn, which was formally activated and commissioned on 26 October 2012. No. 39 Squadron personnel were planned to gradually return to the UK in 2013 and in time both squadrons would each operate five Reapers from RAF Waddington. In April 2013, XIII squadron started full operations from RAF Waddington, exercising control over a complement of 10 Reapers, at that point all based in Afghanistan. Five Reapers can provide 36 hours of combined surveillance coverage in Afghanistan with individual sorties lasting up to 16 hours; a further five vehicles increases this to 72 hours. In total, RAF Reapers flew 71,000 flight hours in Afghanistan, and dropped 510 guided weapons (compared to 497 for Harrier and Tornado). In April 2013, it was revealed that the MOD was studying the adoption of MBDA's Brimstone missile upon the MQ-9. In December 2013, several successful test firings of the Brimstone missile from a Reaper at Naval Air Weapons Station China Lake to support integration onto RAF Reapers. Nine missiles were fired at an altitude of 20,000 ft at distances of 7 to 12 km (4.3 to 7.5 mi) from the targets; all nine scored direct hits against static, accelerating, weaving, and fast remotely controlled targets. In 2014, the MOD decided that its Reaper fleet will be brought into the RAF's core fleet once operations over Afghanistan cease. Procurement of the MQ-9A was via an urgent operational capability requirement and funded from the Treasury reserve, but induction into the core fleet will have them funded from the MoD's budget. The Reapers were retained for contingent purposes, mainly to perform intelligence, surveillance and reconnaissance (ISR), until its replacement enters service around 2018. On 4 October 2015 David Cameron announced that the RAF would replace its existing fleet of 10 Reapers with more than 20 of the "latest generation of RPAS", named as "Protector", In April 2016 document, the MoD revealed that Protector will be a version of the MQ-9B SkyGuardian, formally known as Certifiable Predator B (CPB), made to fly in European airspace, and will be acquired from 2018–2030. In July 2018, it was announced that this aircraft will be designated Protector RG Mk 1 in RAF service, and is to be delivered in 2023. On 16 October 2014, the MOD announced the deployment of armed Reapers in Operation Shader, the UK's contribution to the United States-led military intervention against Islamic State, the first occasion the UK had used its Reapers outside Afghanistan. The number of aircraft out of the RAF's 10-plane fleet was not disclosed, but it was expected that at least two were sent; more were dispatched as the UK drew down from Afghanistan. RAF Reapers' primary purpose is to provide surveillance support and situational awareness to coalition forces. On 10 November 2014, the MoD reported that an RAF Reaper had conducted its first airstrike against Islamic State forces, firing a Hellfire missile at militants placing an IED near Bayji. RAF Reapers based at RAF Akrotiri in Cyprus conducted one surveillance mission over Syria in November 2014, four in December 2014, and eight in January 2015. On 7 September 2015, Prime Minister David Cameron announced that two Islamic State fighters from Britain had been killed in an intelligence-led strike by an RAF Reaper near Raqqa, Syria, the first armed use of RAF assets in Syria during the civil war. By January 2016, RAF Reapers had flown 1,000 sorties in support of Operation Shader. Compared to operations in Afghanistan, where RAF Reapers fired 16 Hellfire missiles in 2008, 93 in 2013, and 94 in 2014, in operations against ISIL 258 Hellfires were fired in 2015. In June 2017, the US State Department approved the sale of 22 drones to India, costing around 2-3 billion USD. In January 2018, the Belgian Ministry of Defence reportedly decided on the MQ-9 to fulfill its medium-altitude long-range UAV requirement. Ministry officials stated that a request for information had been sent to potential suppliers of the system, and that they had received responses from all of them. In October 2018, Belgium confirmed its selection of the MQ-9B SkyGuardian variant, adding that it would be considered a "reconnaissance" asset, suggesting it will not be used to carry weapons. In March 2019, the US Department of State approved the sale of four MQ-9B SkyGuardian UAVs to Belgium for $600 million, pending approval by US Congress. A navalised Reaper, named Mariner, was proposed for the U.S. Navy's Broad Area Maritime Surveillance (BAMS) program. It had an increased fuel capacity for an endurance of up to 49 hours. Variations included one for aircraft carrier operations with folding wings for storage, shortened, reinforced landing gear, an arresting hook, cut-down or eliminated ventral flight surfaces and six stores pylons for a total load of 3,000 pounds (1,360 kilograms). The Northrop Grumman RQ-4N was selected as the BAMS winner. The US Customs and Border Protection (CBP) operates two maritime variants of the MQ-9, known as Guardians. The U.S. Coast Guard evaluated the Guardian, including performing joint operations with CBP. The CBP and the Coast Guard operate one MQ-9 Guardian jointly out of land-based stations in Florida and Texas. General Atomics hopes to test a sonobuoy launch capability from the Guardian in 2016 to demonstrate its ability to carry them, control them, and send information back to the ground station over a SATCOM link. On 24 May 2012, General Atomics conducted the successful first flight of its upgraded MQ-9 Block 1-plus Reaper. The Block 1–plus version was designed for increased electrical power, secure communications, automatic landing, increased gross takeoff weight (GTOW), weapons growth, and streamlined payload integration capabilities. A new high-capacity starter generator offers increased electrical power capacity to provide growth capacity; a backup generator is also present and is sufficient for all flight-critical functions, improving the electrical power system's reliability via three independent power sources. New communications capabilities, including dual ARC-210 VHF/UHF radios with wingtip antennas, allow for simultaneous communications between multiple air-to-air and air-to-ground parties, secure data links, and an increased data transmission capacity. The new trailing arm main landing gear allows the carriage of heavier payloads or additional fuel. Development and testing were completed, and Milestone C was achieved in September 2012. Follow-on aircraft will be redesignated MQ-9 Block 5. On 15 October 2013, the USAF awarded General Atomics a $377.4 million contract for 24 MQ-9 Block 5 Reapers. The MQ-9 Block 5 flew its first combat mission on 23 June 2017.
International demand for a MALE RPAS capable of being certified for operation within civilian airspace drove General Atomics to develop a version of the platform known by GA-ASI as SkyGuardian, previously called Certifiable Predator B, in order to make it compliant with European flight regulations to get more sales in European countries. In order to fly over national airspace, the aircraft meets NATO STANAG 4671 airworthiness requirements with lightning protection, different composite materials, and sense and avoid technology; performance changes include a 79 ft (24 m) wingspan that has winglets and enough fuel for a 40-hour endurance at 50,000 ft (15,000 m). Features include High Definition EO/IR Full Motion Video sensor, De/Anti-Icing System, TCAS and Automatic Take-Off & Land. The system also includes a completely redesigned & modernized integrated ground control station with 4 crew stations. The SeaGuardian is a proposed version of SkyGuardian but also fitted with Multimode 360 Maritime Surface Search Radar and Automatic identification system (AIS). In April 2016, the United Kingdom announced that it intended to place an order for the Certifiable Predator B as part of its Protector MALE UAV programme for the Royal Air Force. According to the 2015 Strategic Defence and Security Review, the Royal Air Force will operate at least 20 Protector systems by 2025, replacing all of its current 10 MQ-9A Reapers. On 15 July 2018, a GA-ASI Company owned MQ-9B SkyGuardian was flown from the United States to RAF Fairford in the UK for the first transatlantic flight of a MALE UAV. It is to be displayed at the Royal International Air Tattoo (RIAT) air show where the aircraft was given RAF Markings of No. 31 Squadron RAF. This follows an announcement by the RAF's Chief of Air Staff that 31 Sqn would be the 1st RAF Squadron to operate a similar version of the MQ-9B aircraft, to be known as the Protector RG Mark 1, starting in 2023. Protector will be able to carry up to 18 Brimstone missiles. Up to 4 AGM-114 Hellfire air to ground missiles can be carried or four Hellfire missiles and two 500 lb (230 kg) GBU-12 Paveway II laser-guided bombs. The 500 lb (230 kg) GBU-38 Joint Direct Attack Munition (JDAM) can also be carried. Testing is underway[needs update] to support the operation of the AIM-92 Stinger air-to-air missile. In March 2014, MBDA successfully test fired a dual mode Brimstone missile from a Reaper aircraft on behalf of the UK Ministry of Defence and Royal Air Force. ^ "MQ–1 Predator / MQ–9 Reaper". Aeroweb. Retrieved 27 November 2015. ^ "Analysis of the Fiscal Year 2012 Pentagon Spending Request". National Priorities Project. 15 February 2011. Retrieved 1 January 2012. ^ "Fiscal Year (FY) 2013 President's Budget Submission, Aircraft Procurement, Volume 1" Archived 11 November 2013 at the Wayback Machine. U.S. Air Force, February 2012. p. Vol. 1–221. ^ Escutia, Sondra (29 October 2009). "4 remotely piloted vehicle squadrons stand up at Holloman". US Air Force. Archived from the original on 29 July 2012. Retrieved 1 January 2012. ^ Peterson, Kyle (16 December 2009). "You say "drone," I say "remotely piloted"". Reuters. Retrieved 1 January 2012. ^ a b c d "'Reaper' moniker given to MQ-9 unmanned aerial vehicle". US Air Force. 14 September 2006. Archived from the original on 14 September 2011. Retrieved 1 January 2012. ^ a b c "MQ-9 REAPER fact sheet". US Air Force. 18 August 2010. Retrieved 27 December 2011. ^ Charles J. Hanley. "Unmanned Reapers bound for Iraq, Afghanistan". Air Force Times. Retrieved 12 January 2012. ^ a b c d e "Remarks by Secretary Gates at the United States Air Force Academy". Department of Defense News Transcript. 4 March 2011. Archived from the original on 10 April 2011. ^ Whittle, Richard. "The Man Who Invented the Predator". Air & Space Magazine. Air & Space Magazine. ^ a b "Predator B UAS". General Atomics. Archived from the original on 11 October 2008. Retrieved 12 January 2012. ^ Note: endurance figures vary greatly from source to source. The current figure being publicized by the USAF is 14 hours. ^ a b c d e Greg Goebel (1 March 2010). "Unmanned Aerial Vehicles". Archived from the original on 20 November 2012. Retrieved 12 January 2012. ^ a b "Reaper: A New Way to Wage War". Time: 40. 1 June 2009. ^ "Air Force's hunter-killer UAV now flying in Afghanistan". US Air Force. 10 November 2007. Archived from the original on 29 June 2011. Retrieved 12 January 2012. ^ Spencer Ackerman (14 December 2010). "Air Force Is Through With Predator Drones". Wired. Retrieved 12 January 2012. ^ Shaun Waterman (5 August 2008). "Bigger, Deadlier Reaper Drone Deployed In Iraq". The Washington Times. ^ "USAF slammed for pranging Predators on manual". The Register. 29 April 2009. Retrieved 12 January 2012. ^ Collinson, R.P.G. (2011). Introduction to Avionic Systems. Springer. p. 495. ISBN 978-94-007-0707-8. ^ Elmendorf, Douglas W. (2010). Alternatives for Modernizing U.S. Fighter Forces. DIANE Publishing. p. 38. ISBN 978-1-4379-2250-9. ^ "Sense and Avoid: The United States Air Force Perspective" (PDF). UVS-Info. Archived from the original (PDF) on 4 March 2016. Retrieved 27 November 2015. ^ SSgt Amy Robinson (11 August 2006). "FAA Authorizes Predators to seek survivors". Air Combat Command Public Affairs. Archived from the original on 29 June 2012. Retrieved 1 September 2006. ^ Marc V. Schanz (November 2011). "The New Normal for RPAs". airforce-magazine.com. 94 (11): 53. ^ "Predator B Extended Range Conducts First Flight With Long Wings". General Atomics & Affiliated Companies. Retrieved 17 April 2017. ^ Ryan Whitney (3 May 2007). "Air Force stands up first unmanned aircraft systems wing". 99th Air Base Wing Public Affairs. Archived from the original on 8 May 2007. ^ "Reaper scores insurgent kill in Afghanistan". Air Force Times. 29 October 2007. Retrieved 15 August 2008. ^ Brook, Tom Vanden, "Air Force Requests More Fighter Drones", USA Today, 6 March 2008, p. 6. ^ Thom Shanker (29 July 2008). "Air Force Plans Altered Role in Iraq". New York Times. ^ "Warplanes: Rise of the Droids". bv Strategy Page. 11 August 2008. ^ Drew, Christopher (16 March 2009). "Drones Are Weapons of Choice in Fighting Qaeda". New York Times. Retrieved 17 March 2009. Considered a novelty a few years ago, the Air Force's fleet has grown to 195 Predators and 28 Reapers, a new and more heavily armed cousin of the Predator. ^ Jason Straziuso (24 October 2009). "U.S. Deploys Drones Against Somali Pirates". CBS News. Associated Press. Retrieved 26 September 2010. ^ Chivers, C.J. ; McLean, Alan; Schoenfeld, Amy; Tse, Archie (25 July 2010). "(Non-Combat Event) Equipment Failure Rpr ISAF HQ: 0 INJ/DAM". New York Times. ^ Tony Reichhardt (22 September 2009). "Robot airplane goes AWOL, gets shot down". The Daily Planet. Retrieved 8 September 2010. ^ Zucchino, David (6 July 2010). "War zone drone crashes add up". The Los Angeles Times. ^ Kingstone, Steve (28 October 2011). "US flies drones from Ethiopia to fight Somali militants". BBC. ^ Alabama Set your local edition ». "Libyan officials: U.S. drones behind airport closure". Blog.al.com. Retrieved 18 November 2012. ^ "More Air Force drones are crashing than ever as mysterious new problems emerge". ^ Mizokami, Kyle (2 October 2017). "U.S. Reaper Drone Shot Down Over Yemen". Popular Mechanics. Retrieved 3 October 2017. ^ Jeremy Binnie and Neil Gibson (5 October 2017). "US Reaper shot down over Sanaa". Jane's Defence Weekly. IHS. Retrieved 11 October 2017. ^ Snow, Shawn (2 October 2017). "US MQ-9 drone shot down in Yemen". ^ "NASA ERAST Fact Sheet". NASA. Retrieved 27 December 2011. ^ "Ikhana Unmanned Science and Research Aircraft System". NASA. 15 August 2007. ^ "Emergency UAV Mission to Esperanza Fire". NASA. November 2006. Archived from the original on 17 July 2007. ^ "NASA Supports UAS Fire Mapping Efforts on California Fire". NASA. 1 October 2009. Retrieved 26 September 2010. ^ a b c d "Guardian UAS Maritime Variant Predator B" (PDF). US Customs and Border Patrol. Archived from the original (PDF) on 23 October 2011. Retrieved 3 March 2013. ^ "CBP UAS Overview". U.S. Customs and Border Protection. 6 February 2009. Archived from the original on 16 October 2009. Retrieved 7 February 2009. ^ "Guardian UAS Persistent Maritime Surveillance" (PDF). CBP/USCG UAS Joint Program Office. Archived from the original (PDF) on 1 March 2013. Retrieved 5 February 2012. ^ "CHI06MA121". National Transportation Safety Board. Retrieved 27 December 2011. ^ "National Strategy for Homeland Security". Archived from the original (PPT) on 12 January 2012. Retrieved 26 September 2010. ^ Alice Lipowicz (17 October 2006). "Predator to be on the prowl again". Government Computer News. Archived from the original on 3 November 2006. Retrieved 31 October 2006. ^ "U.S. launches unmanned aerial drones to monitor Manitoba border". Canadian Broadcasting Corporation. 16 February 2009. Archived from the original on 3 May 2009. Retrieved 22 June 2009. ^ "Pilots Say Go Slow on Commercial Drones After Ditching". Bloomberg. ^ "Australia Tests Maritime Surveillance UAV". Defense Update. 4 September 2006. Archived from the original on 8 January 2012. Retrieved 12 January 2012. ^ "RAAF commences Reaper training". 15 February 2015. Retrieved 22 February 2015. ^ "Dominican authorities unleash a US Predator on drug trafficking (Update)". Dominican Today. 16 July 2012. Archived from the original on 9 December 2012. Retrieved 15 August 2012. ^ "Air Algerie Flight AH5017 crash: Plane 'disintegrated,' French officials say". CBC News. 25 July 2014. Retrieved 27 November 2015. ^ a b Michael Fishpool (5 August 2008). "Germany, Italy make initial requests for MQ-9 Reaper". Flightglobal.com. Retrieved 7 August 2008. ^ "Germany – (5) MQ-9 Unmanned Aerial Vehicle Aircraft" (PDF). DSCA. 1 August 2008. Archived from the original (PDF) on 9 December 2008. ^ "Rheinmetall Defence – Heron-Aufklärungsdrohnen für die Bundeswehr". Rheinmetall Defence. 28 October 2009. Retrieved 8 September 2010. ^ "Warum "Heron 1" doch gewann". Handelsblatt.com. 21 June 2009. Retrieved 8 September 2010. ^ "Schwierige Wahl im SAATEG-Wettbewerb". Flugrevue.de. Retrieved 8 September 2010. ^ "Germany selects IAI's Heron UAV for Afghanistan mission". Flightglobal.com. Retrieved 8 September 2010. ^ "Italy – (4) MQ-9 Unmanned Aerial Vehicle Aircraft" (PDF). DSCA. 1 August 2008. Archived from the original (PDF) on 9 December 2008. ^ "Italy Might Reap Two More MQ-9 UAVs". SatNews.com. 24 November 2009. ^ Entous, Adam (29 May 2012). "U.S. Plans to Arm Italy's Drones". Wall Street Journal. Retrieved 7 July 2012. ^ i-HLS. "European Air Forces Seek a Common Weaponized UAS". Retrieved 6 February 2015. ^ Reed Business Information Limited. "Italy flies first Predator B sortie over Libya". Retrieved 6 February 2015. ^ "Il portale dell'Aeronautica Militare – Kosovo: primo volo del Predator". Archived from the original on 6 February 2015. Retrieved 6 February 2015. ^ "Immigration: Italy launches Mare Nostrum, 400 more saved – General news – ANSAMed.it". Retrieved 6 February 2015. ^ Defensie kiest Reaper als onbemand vliegtuig – Ministerie van Defensie, 21 November 2013. ^ a b Air Forces Monthly, December 2007 issue, p.6. ^ Amos, Jonathan (9 November 2007). "Skynet military launch is delayed". BBC News. Retrieved 13 May 2010. ^ Corera, Gordon (6 June 2008). "How UK fights remote control war". BBC News. Retrieved 5 April 2009. ^ "Royal Air Force to get new Reaper squadron". Unmanned. 13 May 2011. Retrieved 19 March 2013. ^ "MOD Top Level Messages – March 2012" (PDF). Archived from the original (PDF) on 16 August 2012. Retrieved 2012-11-18. ^ "BBC News – Armed drones operated from RAF base in UK, says MoD". BBC News. Retrieved 6 February 2015. ^ "U.K. Looks To Integrate Brimstone On Reaper UAV". Aviation Week, May 3, 2013. ^ "PM announces investment in counter terrorism capabilities for the Armed Forces". UK Ministry of Defence. Retrieved 4 October 2015. ^ Stevenson, Beth (7 October 2015). "MoD reveals Reaper derivative will be chosen for Protector". Flightglobal. Retrieved 27 November 2015. ^ "UK deploys Reaper to the Middle East". Ministry of Defence. 16 October 2014. Retrieved 16 October 2014. ^ "Islamic State conflict: Two Britons killed in RAF Syria strike". BBC News. 7 September 2015. Retrieved 27 November 2015. ^ "Modi-Trump meet: 'US approves sale of 22 Guardian drones to India' - Times of India". indiatimes.com. Retrieved 24 June 2017. ^ Williams, Huw (31 January 2018). "Belgium eyes Predator B derivative for MALE UAS requirement". IHS Jane's 360. London. Archived from the original on 2 February 2018. Retrieved 2 February 2018. ^ Fiorenza, Nicholas (25 October 2018). "Belgium chooses F-35, invests in armoured vehicles and MALE UAS". IHS Jane's 360. London. Archived from the original on 25 October 2018. Retrieved 29 October 2018. ^ Perry, Dominic (26 October 2018). "Belgium lines up Predator acquisition". Flight Global. London. Archived from the original on 29 October 2018. Retrieved 29 October 2018. ^ Insinna, Valerie (26 March 2019). "US State Department approves sale of Sky Guardian drones to Belgium". Defense News. Washington. Archived from the original on 26 March 2019. Retrieved 26 March 2019. ^ "Belgium – MQ-9B SkyGuardian Remotely Piloted Aircraft (RPA)". Defense Security Cooperation Agency. Washington. 26 March 2019. Archived from the original on 26 March 2019. Retrieved 26 March 2019. ^ "Future os Unmanned Aircraft Systems Highlighted" (PDF). Delivering the Goods: News from U.S. Coast Guard Acquisition. US Coast Guard. Retrieved 27 December 2011. ^ "National Security Strategy and Strategic Defence and Security Review 2015" (PDF). HM Government. November 2015. Retrieved 23 November 2015. ^ "France conducts its first MQ-9 Reaper flight". janes.com. 26 September 2013. Retrieved 15 October 2013. ^ "Modi government to fast-track acquisition of lethal Predator drones for Indian Navy and Indian Army - The Financial Express". www.financialexpress.com. Retrieved 22 January 2019. ^ "India's Drone Army: Government To Fast-Track Deal With US To Procure 20 Units of MQ9 In 2019". swarajyamag.com. Retrieved 22 January 2019. 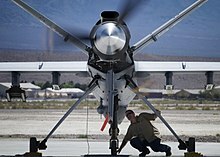 ^ "Italia acquisirà 4 UAV Predator B/Reaper". Difesanews.it. 19 February 2008. Retrieved 8 September 2010. ^ "Gana el Reaper: España comprará cuatro UAV Reaper en versión Block 5 y equipo asociado por 243 miliones de dólares" [Gaining the Reaper: Spain will buy four Reaper UAV version Block 5 and team associated by 243 million dollars]. Defensa.com (in Spanish). 7 October 2015. Retrieved 27 November 2015. ^ "XIII Squadron". Royal Air Force. Retrieved 27 November 2015. ^ "Number 39 Squadron". Royal Air Force. Retrieved 27 November 2015. ^ "Number 54 Squadron". Royal Air Force. Retrieved 6 January 2017. ^ "MQ-9 Reaper / Predator B". Globalsecurity.org. 13 May 2010. Retrieved 8 September 2010. ^ "Reaper UAV To Receive Improved Targeting From Raytheon". SatNews.com. 24 September 2008. Retrieved 8 September 2010. ^ "MQ-9 Reaper Hunter/Killer UAV". Defense Update. Archived from the original on 22 November 2010. Retrieved 8 September 2010. ^ "Field Army ISTAR Handbook (Restricted)" (PDF). Archived from the original (PDF) on 15 May 2008. ^ "Dual Mode Brimstone Achieves Direct Hits in MQ-9 Reaper Testing". MBDA. 24 March 2014. Retrieved 9 December 2014. ^ "AN/DAS-1 Multi-spectral Targeting System (MTS) – B (United States)". Jane's Electronic Mission Aircraft. 15 March 2010. Retrieved 8 September 2010. ^ "Lynx / AN/APY-8". Defense Update.com. 23 August 2006. Archived from the original on 5 January 2010. Retrieved 8 September 2010. Wikimedia Commons has media related to General Atomics MQ-9 Reaper.